It’s barely November, yet my Le Creuset is getting quite the workout: these wintry weekends seem tailor made for steaming bowls of soup and crusty bread to soak it up. In the spirit of last weekend’s onion soup, I went in search of something familiar and comforting while trying to lighten it up a bit, too. I chanced upon a gorgeous selection of plump creminis and chanterelles at the market, which settled the internal debate for me: cream of mushroom soup, here I come. As with the onion soup, my recipe search was disappointingly stilted away from the eponymous ingredient. Heavy on the cream and low on the mushrooms is not what I was after. 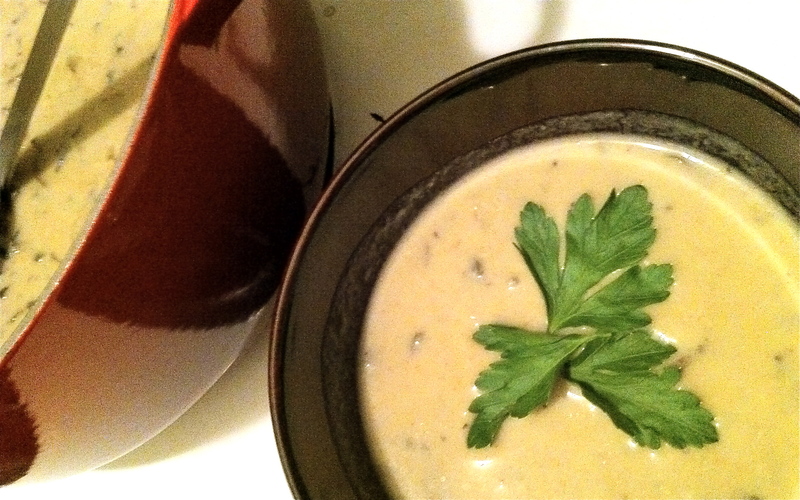 I wanted a soup that tasted earthy; I didn’t want the predominate flavor to be butter. Of course, I should have known I’d find the answer in Julia Child’s Mastering the Art of French Cooking. As soon as I read about dicing the mushroom stems to flavor the vegetable stock I knew I was in good hands. Her secrets to a rich soup without resorting to a pound of butter and a quart of cream? First, a proper well-cooked roux to thicken the mix of sauteed mushroom caps and stock. To give it that velvety mouth-feel that makes “cream of” soups so seductive, beat a few egg yolks with a little heavy cream. Make a liaison with the warm soup and cream mixture by slowly ladling the hot into the cold – you’ll incorporate the two without accidentally making scrambled eggs. Return it to the pot, correct the seasoning and allow the egg to poach. Piping hot, garnished with a little parsley, you’ll feel the cold melt straight away.